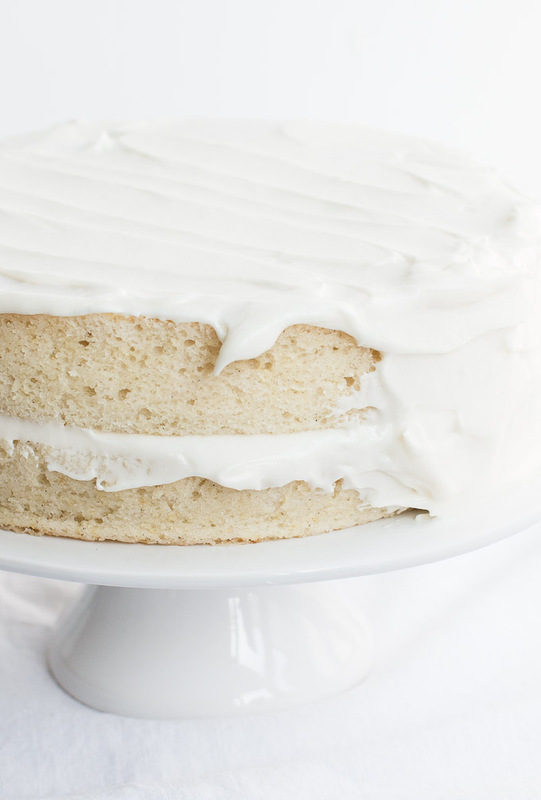 This is the ultimate white cake recipe. 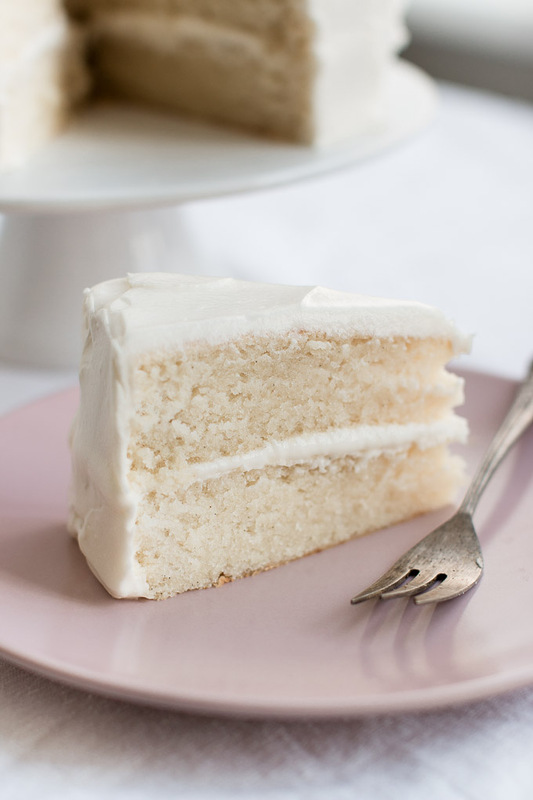 Tender, light, moist, and fluffy cake layers frosted with the creamiest vanilla frosting. 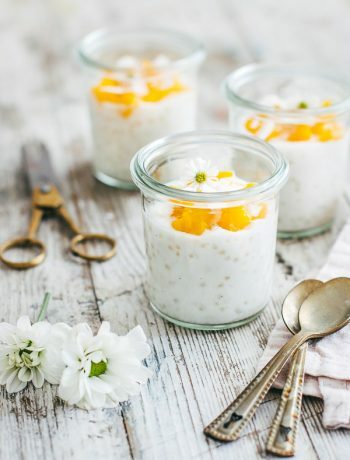 After you try this, you won’t need any other recipe. It’s perfect as a birthday cake, wedding cake, or for any celebration. A few years ago I was at a beautiful wedding in San Francisco where I had the most delicious vanilla cake ever. I was so obsessed with it and couldn’t wait to try it back at home. I tested (and tasted) many recipes to try and recreate it, but as a true perfectionist, I wasn’t impressed with any of them. I was an amateur baker back then, so I gave up the idea quickly. But recently I gave it another try, now that I actually know what I’m doing. I spent the last few weeks trying all kinds of homemade vanilla and white cake recipes until my heart was set on one. 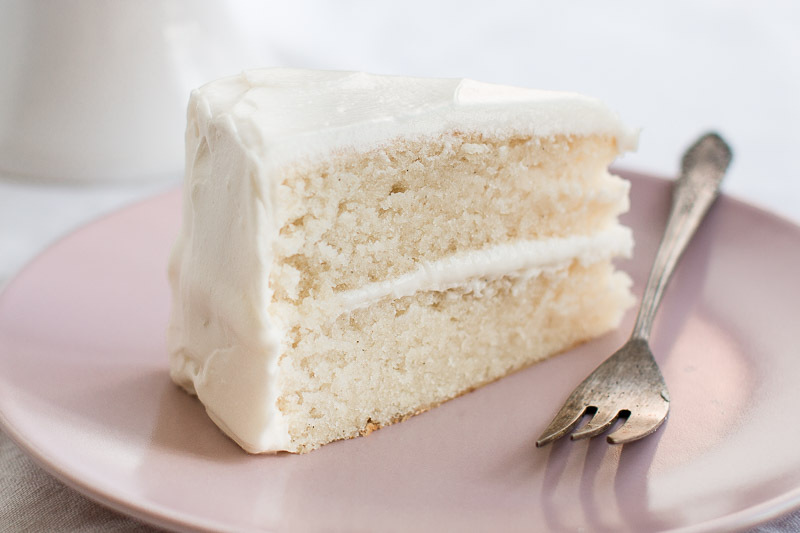 This is the white cake I’ve been dreaming of. It’s a strong statement but it’s true! 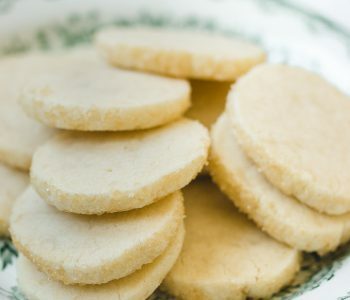 It’s ultra moist with a fluffy texture that almost melts in your mouth, and the delicate buttery, vanilla flavor is heavenly. It makes all the difference. I’ve tested it with imitation vanilla extract, pure vanilla extract, and high quality vanilla extract, which is also pure vanilla extract that tastes superb (but it’s quite expensive). The high quality one wins big time, but since I know not all of you have it, just use any pure vanilla extract for the best flavor. I know that for some, the imitation vanilla extract is the flavor that brings childhood memories, so it’s a matter of personal taste. I prefer pure vanilla flavor. I use egg whites for this recipe. If you want a recipe that uses whole eggs, I’ll be working on that real soon. For a white cake, egg whites are used instead of whole eggs because the egg yolks give the cake a yellowish color. You can use the egg yolks to make creme brulee or Boston cream pie. 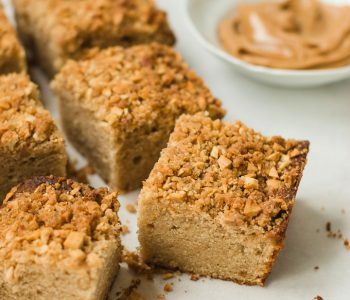 How to bake even, flat cakes? I’ve finally got myself a few cake strips, and it works like a charm. My cakes turned out even, flat and white on the edges. The strips are affordable, don’t take much space in the kitchen, and if you like making layer cakes then it’s a must. The strips are easy to use. Soak them in water, then squeeze out the water, and place them around the cake pans. They’re adjustable for different pan sizes. I use my vanilla buttercream frosting because that’s a classic combination, but if you prefer cream cheese frosting, use it instead. You can experiment with different fillings and frosting. You can use lemon curd or jam as the filling. I highly recommend sticking to the recipe. Using butter and sour cream is what makes this recipe so good. It's best if all the ingredients (eggs, milk, sour cream) are at room temperature, but make sure to separate the eggs while they are still cold because it's easier. If you don't have a stand mixer, use a hand mixer. I recommend lining the bottom of the cake pan with parchment paper to ensure that the cakes come out of the pan in one piece. I cut parchment paper rounds the size of the pan. Preheat oven to 350°F/180°C. Butter two 9-inch cake pans (8-inch would work too) that are at least 2-inch high, and line the bottoms with parchment paper. 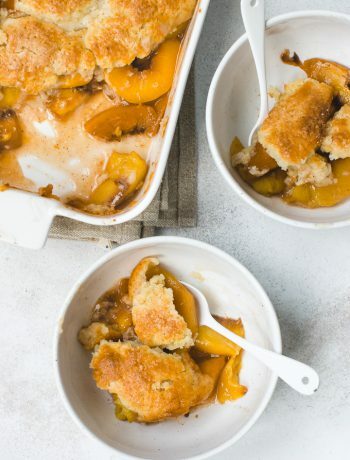 In a medium bowl, sift together flour, baking powder, baking soda, and salt. In another medium bowl combine sour cream and milk. Set bowls aside. In a standing mixer fitted with the paddle attachment, beat butter and sugar on medium speed until light and fluffy, 3-4 minutes. Scrape down the sides and bottom of the bowl as needed. Add egg whites and vanilla extract and beat until combined. With the mixer on low speed, add half of the flour mixture and beat until combined. Add milk mixture and beat until combined. Add the other half of the flour mixture and beat just until combined. Do not over mix – the less you mix, the lighter the cake will be. Frosting: In the bowl of an electric mixer fitted with the paddle attachment, beat butter and salt on medium speed until smooth and creamy, about 2 minutes. Add the rest of the ingredients and beat on low speed for 30 seconds, then increase speed to high and beat for 2 minutes. Beat in more powdered sugar if frosting is too thin. Assembly: If the cakes rose too much, cut their rounded top with a knife to make them flat. Set one cake layer on a plate or cake stand. Evenly spread a thick layer of the frosting over the cake to the edge. Top with the second cake layer. Spread frosting over the top and sides of the cake. Cake should be kept in the fridge, but bring it to room temperature before serving. What is “high quality” vanilla? As opposed to the pure vanilla extract, that is. Hi Ari, both are pure vanilla extracts, but the higher the quality, the better the flavor, and every brand tastes different. 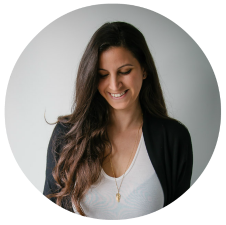 I added links to both of my favorite products, one that is quite expensive, and another that is more budget friendly. Hi ! 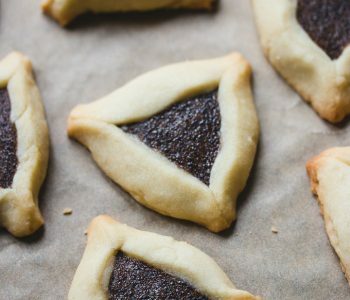 Can i use oil instead of butter? Oil will change the entire texture and flavor of the cake, so it’s not possible to use it. Is it possible to fold in Oreo crumbs and make it a cookies and Creme cake? Thank you! Hi Jasmine, yes, you can fold in 1 cup or more chopped Oreos or Oreo crumbs, and you can add some to the frosting as well. What’s the substitution for heavy cream? It depends on the recipe, but for the frosting recipe you can leave it out or use a bit of whole milk instead. Thanks for the recipe! I found the cake to be very light, airy, and buttery. It was delicious. But! — you just knew it was coming –I found the frosting to be very sweet. The consistency was perfect for spreading but I wound up using only five cups of the powdered sugar due to my tasting it along the way and finding it sweet. I think I’ll try it again with the cream cheese frosting. But overall, it’s a perfect cake. I used strawberry jam for the filling and it all came about deliciously I’m adding this one to my list of cakes to bake for occasions. Sour cream isn’t easily available in my country. Is there a substitute? Hey, here’s a good guide. I usually use greek yogurt, yogurt, or buttermilk. I haven’t tested them in this recipe so I can’t say which one is the best substitute. Can you use Cake flour instead of all purpose? Yes, you can use 315 grams of cake flour instead. 315 grams is 2 1/2 cups but the recipe says to use 2 1/4 c of flour. Which is correct? Is there an actual conversion to use cake flour? Thanks! There are different ways to measure flour. I use the one that uses more flour (1 cup = 140 grams) to make sure you don’t end up with too much flour, and also because that’s how I see many bakers measure it when they don’t use kitchen weight (without them knowing about the different methods). You can read about the 2 methods here. I have no experience baking with microwave convection, sorry! Loved the consistency of this cake, but may try it with less butter next time. It seemed to almost caramelize and be over buttery, but still delicious! My question though is the color. I don’t know if you’re photos are just in natural lighting and edited or if my coloring is just WAY off!! It definitely came out a yellow color…any thoughts on this? I followed the recipe exactly so I’m not sure where it came off, but would love your insight! The color might be slightly different due to editing, but my cake was more white than yellow in color. If your butter is very yellow, that may cause that. I used white butter. Wow! Best white cake ever. I followed the recipe exactly, sifting, and room temp, etc. I used a bit less sugar but that was only difference. I used my own frosting recipe because it uses only a 1/2 cup sugar. 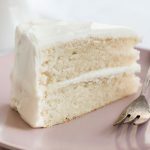 All I can say is that I have been trying white cake recipes for 30+ years, but I don’t have to try any other recipe now – this recipe is IT! Thank you so much for sharing your wonderful expertise and recipe! I’m so glad, Hilary! Thank you so much! 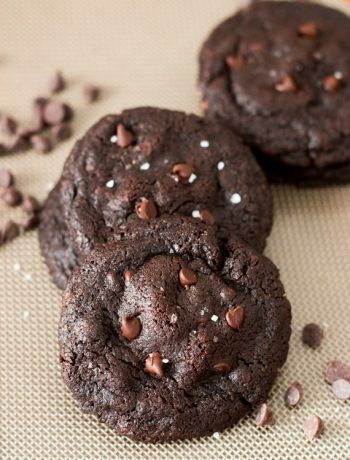 Just made this recipe recipe tonight and already going to bake another batch again! Thank you so much! I wish to use this recipe to make a rainbow cake with natural water based coloring. In order to keep the liquids balanced (the natural colors r very dilute), I thought to replace the milk with the colored water. What might happen if I make this replacement? Hi Sivan, you can replace some of the milk with it, but not too much. I don’t recommend replacing all of the milk, because this will affect the cake’s texture and flavor. This is hands down the best recipe iv come across! Love it and the buttercream icing! I put white food dye in too help with the icing colour but the cakes came out relatively white, and tasted amazing, everyone loved it! oh my gosh, this was THE best cake EVER!! I made this for our Christmas gathering and everyone raved about it! I only made 1/2 recipe and baked it up in a true 8×8 pan, then slathered on some cream cheese frosting. Thank you so much for this recipe, definitely a winner! I made this cake yesterday for a New Year’s Eve party. It was the best white cake I have ever made. I folded in 1/2 cup coconut to the cake before baking. The secret is like you said: do not over mix in the final mixing of dry ingredients. I used a homemade 7 minute frosting. It was delicious. Absolutely the best. FOLLOW THE DIRECTIONS! Can I use cream instead of whole milk?? I’m needing to make a half sheet cake (2 actually, since it will be a 2-layer cake) and the customer wants white cake. 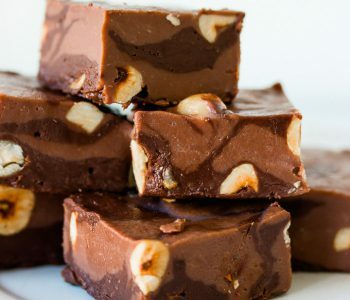 Do you recommend doubling this recipe for each layer or would one batch of the recipe work per half sheet cake? Thanks in advance! This cake is so delicious! The best one I’ve come across so far! Thank you for the recipe! I baked it twice -one with the amount of sugar shown then I tried baking it again with only 1-1/4 cup of sugar and I prefer the one with less sugar but both equally delicious depending on your sweet tooth! Question…I like my cakes with slightly taller layers so do you think it’s ok to make more batter by adding half of each ingredient? Also the batter was super super thick..should it be more smooth and on the liquidy side? For years I have wanted a dense white cake, tired sooo many, but they were always “light and airy”……not what I wanted. I wanted a denser , moist cake—and this is it!! Thank you so much for this recipe, it is perfect. Can I use a 9 x 13 pan to bake this cake? 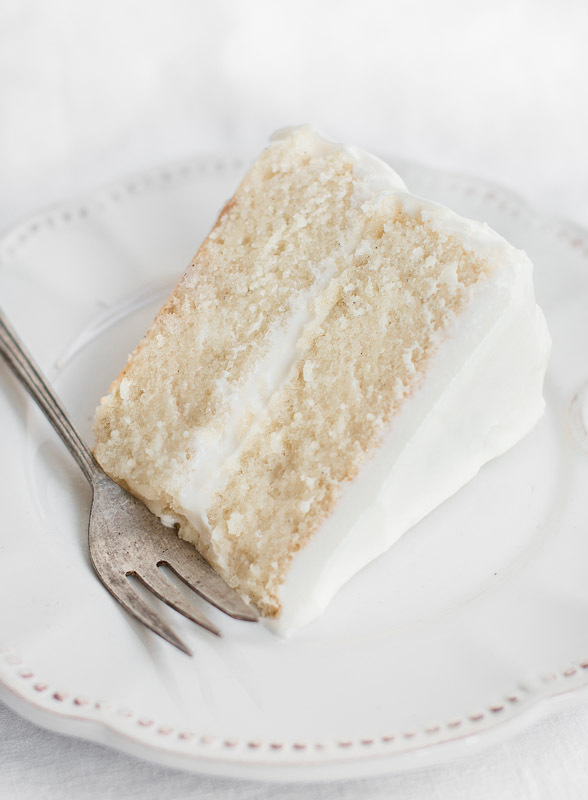 This is one of the best recipes I have used for a basic white or yellow cake. It is so moist yet very light and fluffy. I substituted full fat greek yogurt for sour cream as I ran out of it and it was delicious! I was wondering if you have a video on this cake? I also have a question, other recipes have you whip the egg whites first, did you find that an unnecessary step to make it fluffy? This is my first attempt for a white cake. Thank you. 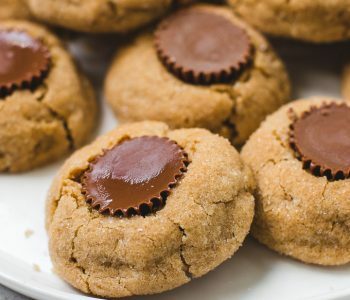 Can this recipe be used in (3 )6″ pans? Hi Susannah, you can use this guide. This cake is excellent. Moist and flavourful. Love it. Can I substitute with unsweetened applesauce? And if yes, how much to use? I am on a strict diet, so no butter, milk or sour cream for me. Is there no need to beat the egg whites before folding in. Can we use one pan because I have heart shaped one and don’t have another or I put in other Pan and at end just cut the heart shape? Hi Laura. It really depends of the size of the pan, so I can’t say for sure. You can use different pans as long as you don’t overfill them with batter. The baking time will also change. Wonderful cake. If people want to substitute different ingredients they should not make this cake. It’s so perfect. Just the way it is. I tell my children if you want to start substituting and changing measurements on my recipes, pick another recipe. It’s 5 stars for a reason. Your recipe is getting added to my collection of yummy cakes. 2 sticks of butter and all!!!! I found your recipe via Instagram, made it tonight and with some reduced sugar amount, it was what I wanted – light, airy and moist (and yellow coz my butter was yellow), but quite buttery! I was wondering if I reduced the butter amount, would it affect the cupcake? You can try to slightly reduce the amount of butter if you like, but I always suggest to stick to the recipe for the best result. I probably should’ve added that I made these as cupcakes, not round cake.